The chance to undertake a position as an EVS/ESC (European Voluntary Service/European Solidarity Corps) volunteer at MOAS was a valuable experience providing diverse professional development, useful insights, and exciting challenges to overcome. I had been looking for an opportunity to work for a cause I truly believed in, as my personal, professional and academic interests lie mainly with issues surrounding migration and humanitarian assistance. When offered an EVS/ESC position with MOAS – an organisation known worldwide for providing vital humanitarian assistance to refugees and migrants fleeing violence and persecution – it seemed like an opportunity not to be missed. Being able to contribute in any way I could, through my skills and experience, to many of the different projects MOAS is involved in was a dream both personally and professionally. Of course, this meant relocating to Malta for the duration of the period, and adapting to Maltese life. This has been such a positive experience that I am currently intending to stay in Malta beyond the end of my time as a volunteer. 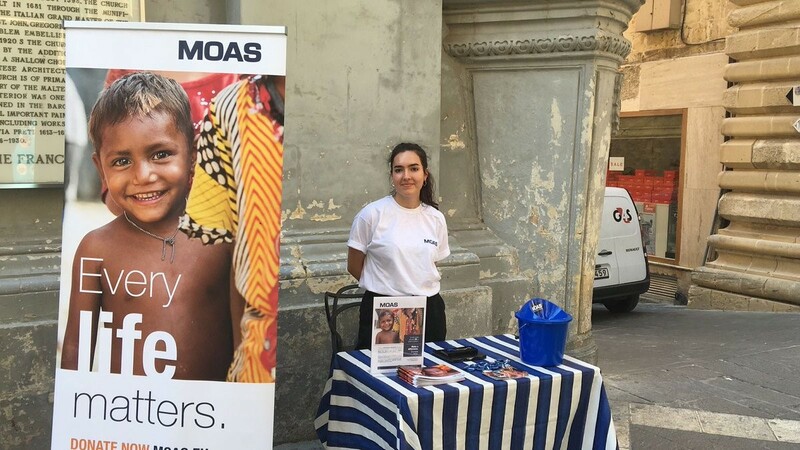 One of the biggest perks of working for MOAS has been the hands-on experience and exposure that you get, unlike what usually happens at bigger, top-down humanitarian organisations. Being able to work closely with senior members of staff, as well as being present in meetings where key decisions have been taken, has offered me a vital and comprehensive glimpse into the inner workings of an international humanitarian NGO. Part of my time with MOAS was spent assisting with the projects of Xchange, MOAS’ research partner. Being involved in their projects provided a platform to expand my research abilities within the migration arena, while confirming for me the potential of data to transform public perceptions of human migration. Without a doubt, however, the best thing about volunteering for MOAS has been its people. It has been an absolute honour to learn from and work with extremely talented professionals who are genuinely passionate about their work and the impact that it has on the lives of so many. I have grown immensely throughout my time here, both personally and professionally. Those who have ever been involved in volunteering will know what I’m talking about. For those still thinking about whether volunteering is for them, I hope this glimpse into my placement with MOAS has opened your eyes to its immeasurable benefits for individuals and society alike.